Ten species of Luzula are recorded in Britain. These include the native Curved Wood-rush (L. arcuata), Field Wood-rush (L. campestris), Southern Wood-rush (L. forsteri), Heath Wood-rush (L. multiflora), Fen Wood-rush (L. pallidula), Hairy Wood-rush (L. pilosa), Spiked Wood-rush (L. spicata) and Great Wood-rush (L. sylvatica) and the introduced White Wood-rush (L. luzuloides) and Snow-white Wood-rush (L. nivea). The BSBI provide a downloadable plant crib for Luzula. Ten British miners are recorded on Luzula. A key to the European miners recorded on Luzula is provided in Bladmineerders van Europa. 1a > Leaf-miner: Larva forming irregular linear mine (Spencer, 1990: 345). On Luzula pilosa in Britain and elsewhere. Only from Oxford in Britain. Widespread in continental Europe. Chromatomyia luzulae (Hering, 1924) [Diptera: Agromyzidae]. 1b > Leaf-miner: Long, rather narrow mine, upper surface or interparenchymal. The mine changes direction twice (upper to lower or vice versa). 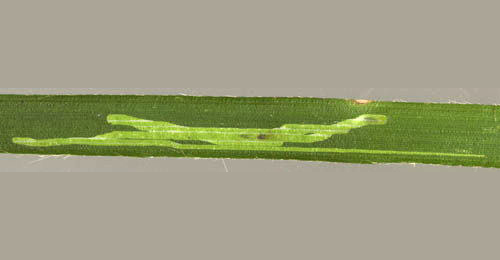 The mine frequently finishes in the leaf sheath. Frass in one or two large clumps (Bladmineerders van Europa). On Luzula sylvatica in Britain and elsewhere. Only recorded from South Gloucester in Britain. Not uncommon in northern and central Europe. Cerodontha silvatica (Groschke, 1957) [Diptera: Agromyzidae]. 1c > Leaf-miner: Long, rather narrow corridor, upper-surface or interparenchymatous mine. The mine changes direction one or two times. Often the corridor ends in the leaf sheath. Frass in one or two large lumps. Puparium in the lower part of the mine. Hibernation in the puparial state (Bladmineerders van Europa). On Luzula multiflora and Luzula pilosa in Britain and additional species of Luzula elsewhere. Widespread and continental Europe. Cerodontha bimaculata (Meigen, 1830) [Diptera: Agromyzidae]. 1d > Leaf-miner: Larva forming irregular linear mine (Spencer, 1990: 345). Recorded as new to Britain by Bland (1993a). On Luzula sylvatica in Britain and elsewhere. Widespread in continental Europe. Cerodontha luzulae (Groschke, 1957) [Diptera: Agromyzidae]. 1a > Leaf-miner: The larva mines from the grass tip downwards and the mine occupies half or the whole of the leaf blade width. A whitish blotch is formed with characteristic narrow streaks of frass (British leafminers). Full depth blotch, slightly inflated, descending from the leaf tip, occupying half or the entire width of the blade. The larva may move and make a new mine elsewhere. In the latter case the mines are fairly short; otherwise an entire blade may be mined out. Frass in a some narrow greyish brown streaks. Pupation outside the mine (Bladmineerders van Europa). 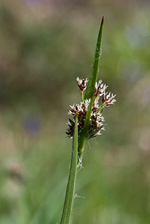 On Dactylis, Deschampsia and Holcus, but not yet on Luzula, in Britain plus Luzula, Agrostis, Alopecurus, Arrhenatherum, Avena, Avenula, Brachypodium, Bromus, Calamagrostis, Elymus, Festuca Koeleria, Phalaris, Phleum, Poa, Trisetum and Triticum elsewhere. Widespread in Britain, Ireland and continental Europe. 1b > Leaf-miner: Corridor widening while descending from the tip of the leaf. The mine is unusual because the sides are very irregularly scalloped out. Moreover, the mine is not evenly transparent, but rather yellowish green and motly, because the larva leaves patches of parenchyma uneaten, and does not feed full depth. Frass in a few irregular, interrupted length lines. Often 2-3 larvae in a mine. The larvae hibernate in the centre of the mine; after winter they leave their mine and pupate ( Bladmineerders van Europa). On 'various grasses', but not yet on Luzula, in Britain plus Luzula, Agrostis, Arrhenatherum, Brachypodium, Calamagorstis, Dactylis, Deschampsia, Elymus, Festuca, Glyceria, Holcus, Melica, Milium and Poa elsewhere. Widespread in Britain, Ireland and continental Europe. 1c > Leaf-miner: The larva starts mining near a leaf tip in early autumn. This early mine approximates to being linear but is very erratic in its course. In earl winter the the larva usually moves to anew leaf. This second mine usually takes the form of a compact but irregularly brownish blotch close to or often within the area of purplish discoloration of the dying leaf tip. Occasionally the larva does not change mines but extends the one made in autumn. Pupation takes place in a concealed place amongst debris or between closely applied leaves (Bland and Knill-Jones, 1988). Egg generally at the underside of the leaf tip. From September until the following spring a narrow meandering corridor is made. Then gradually the corridor widens to nearly the full width of the leaf. Generally the larvae make a new mine in early winter, obviously without the initial corridor. The mine in this stage is brown and situated close to (or within) the red coloured dying apical part of the leaf. Frass in large elongate dark spots. Pupation external (Bladmineerders van Europa). On Carex and Luzula in Britain plus Deschampsia elsewhere. Widespread in Britain and continental Europe. Also recorded in the Republic of Ireland. Elachista gleichenella (Fabricius, 1781) [Lepidoptera: Elachistidae]. 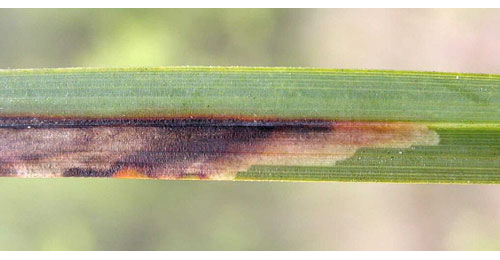 1d > Leaf-miner: The mine formed is long, inflated and puckers the leaf surface. The larva often swaps leaves (British leafminers). Oviposition generally at the underside of the top half of the leaf. Between September and the end of February a very narrow mine is made, not longer than 3 cm, parallel to the midrib. The mine then suddenly widens to almost the full width of the leaf. The frass is concentrated in the transition area of the two mine types. In the broad part folds develop. Larvae can make a new mine, obviously without the initial part. Here the frass in concentrated around the entrance hole. Pupation outside the mine (Bladmineerders van Europa). On Luzula in Britain and elsewhere. Occurs in South West England, from Monmouth in Wales and the East of Scotland. Romania, Germany and The Netherlands. Elachista regificella Sircom, 1849 [Lepidoptera: Elachistidae]. 1e > Leaf-miner: A strongly contracted upper-surface tentiform mine, generally in the lower third of the leaf, beginning at the leaf base. Often a second or third mine is made, starting from the leaf tip. These secondary mines begin as a narrow, almost completely frass-filled corridor, that continues down to the leaf base.al the while widening into a tentiform mine. Pupation outside the mine (Steuer, 1980a) (Bladmineerders van Europa). On Luzula in Britain and elsewhere. Widespread in Britain and continental Europe. Elachista tengstromi Kalia, Bengstsson, Sulcs and Junnilainen, 2001 [Lepidoptera: Elachistidae]. 1f > Leaf-miner: The mine in Luzula pilosa is rarely at the leaf-tip, being usually about halfway down the leaf blade and well clear of the winter/pring dieback. The autumn mine typically consists of a long stright slended gallery folloowing one of the veims. The mine is no wider than the larva and the frass is scattered towards or away from the leaf-tip. In spring the mine is contined as a broad elongated gallery with frass irregularly placed. Pupation occurs on the upper surface of a leaf and is anchored by a silk girdle (Bland and Knill-Jones, 1988). From autumn until early spring the larva makes a quite narrow corridor with a total length of 12-16 cm, essentually running parallel to the leaf venation; the corridor may change direction 2-3 times. Generally the corridor lies about halfway the length of the leaf. In March-April this gallery abruptly gives way to an elongate blotch, that generally obliterates the original gallery. The larva may leave its mine and restart elsewhere by making a lower-surface opening in a new leaf, not far from the leaf-tip. Pupation external (Bladmineerders van Europa). On Luzula in Britain and elsewhere. Widespread in Britain and continental Europe. Also recorded in the Republic of Ireland. Elachista trapeziella Stainton, 1849 [Lepidoptera: Elachistidae].